Monday evening I was keen to have a quick fish before the southwesterly blow hit. I set the 25 hook Boat Longline near No 8 marker in 13 metres of water. There was a lot of fish activity, tiny sprats on the surface followed by kahawai and small mullet jumping for joy. Not too many fish went onto the line but I did get a feed. I am keen to prove to myself the effectiveness of the floating beads, so I put them on every hook and on the traces on the ledger rig of the rod. I caught a gurnard on the rod two metres off the bottom. When pulling the longline in I usually pull one end of the longline in and remove the grapnel. I can usually feel if there are any good fish on the line. This time I felt nothing. Pulling the other end into the boat there was one 30cm snapper, a kahawai and then almost to the other end, there it was. A beautiful 2kg snapper. I can only assume this fish went onto the hook quite near to the surface which is not surprising in itself. I suspect that the floating beads present the hook well in the column of water. Will keep you posted on my next trip. Well another week of inclement weather, if its not the wind then its the sea. On Tuesday we had 10 knots of northeasterly wind, which is not bad on it's own but there was a northeast swell over two metres which makes beach fishing difficult. Late last week we had very little wind but a 3-4 knot northerly rip. Two parties were trying their luck on the beach using electric kontikis. They had no success due to the rip and unfortunately their gear ended up on the beach in front of us. The good news is one kitefisher managed to get his dropper rig out through the rip, but I didn't get a report of how he got on. Will have to try and track him down. On Saturday the rip changed to a southerly of two knots. Once again there was a fisher with an electric kontiki on the beach. He tried twice to get his gear out, both times it was forced back onto the beach by the rip. On Monday the rip wasn't so bad. A party from Taihape arrived with an electric kontiki rig and had a go. This time it was the surf that beat them. 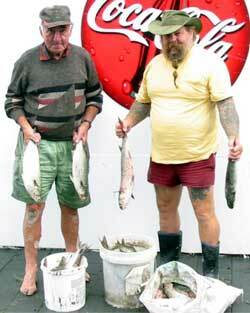 Above : A couple of locals with mullet they caught this morning. Despite all of this a few surfcasters have been out fishing and landed some good sized kahawai. Last weekend the Akitio Fishing Club held their annual fishing competition. According to the reports I have had, fishing on Friday was cancelled due to the conditions. Saturday and Sunday were better days. Some good sized crayfish were landed but the fishing was very slow. That's all from me at the moment, if you are in the area call in and have a chat. Five of us went fishing at Motiti Island, Bay of Plenty, with "Maf Off Charters" from Maketu. We spent a couple of hours pulling in kahawai from the Astrolab area. All of these were between 2.5 - 3kg in weight. It was great fun. We went close into Motiti Island itself. We fished in 25 metres of water. Put down the Boat Longline fitted with Floating Bead Traces. I bought these the week before so I could try them out. Using a mixture of squid and kahawai for bait we laid out 24 traces. The return floored us. Twelve snapper up to 4kg. We were very excited so we decided to put it down again around the southern end of Motiti using the same bait. Not as big a return this time but to our surprise, up came six scallops clinging to the backbone. This was on top of the six pan sized snapper we had hooked on the Target Hooks. We absolutely enjoyed ourselves and had plenty to take home for dinner. I can confirm that all the snapper were caught on the Target hooks with floating bead traces and all were hooked in the side of the mouth. I love going fishing at the Mangawhai Forest in Northland. I have been there before, so we headed to the southern block which gives good access for kitefishing. Went there two weeks ago and put the Big Dropper Rig out. There was a light southwesterly blowing and an incoming tide. The rig set straight out off the beach and I had no problems getting the gear out. All the hooks were baited with mullet. I caught 11 snapper from the two sets of 20 hooks so I was pretty pleased with the days fishing. We fished for three days at the beginning of January. Put out four sets of 25 hooks using the submarine. Using salted bonito for bait we landed five good snapper. I figure the snapper are in fairly close as I only put the gear out between 600- 800 metres offshore. I worked this out as I saw snapper being caught in nets that were set at low tide from the shore. For anyone fishing at Waihi, we had a lot of trouble with lettuce seaweed. I haven't been back since the first week of January to check if it is still there. First time report but a long time trier. A good friend and myself went up to Napier after being annoyed at wasting good fishing time. We had done five trips out to Akito and Herbertville, which is one hours travel from here. Not even a crab to nibble at our bait. So, north Napier was the place to go. I chucked a matress and rug on the ute, two tons of determination and heaps of hope. We set out for an overnighter. Arrived about 2.30pm, it was not far off high tide. There was a perfect breeze for any type of kite, if you were on the other coast. Anyway, out with the surfcasters and into the fishing. My good friend landed a kahawai weighing about 1kg within minutes of start fishing. This was the first time he had ever caught a fish off the beach. Two cans and heaps of hand shaking later it was back to the fishing. End of trip saw eighteen snapper landed, 12 keepers plus 11 kahawai. 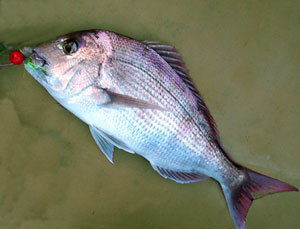 We took two kahawai home for smoking and salting down for bait. This trip happened 23rd 24th January. I went back again on Waitangi Day with my Pocket Sled Kite. It flew like a dream for three hours. I put out a couple of sets with five hooks on each. I didn't manage to catch anything worth taking home. We need some southeasterlies to bring the fish back into the shore. Sorry, no photos but great memories to build on. I went out early a couple of weeks ago, as I heard the wind was going to pick up as the day went on. By the time we arrived at Scotts Ferry, Wellington, there was a moderate westerly coming through. Got the longline set up and started paddling out in the kayak about 9.00am. I only went out about 400 metres as the chop was pretty bad. I got caught on the bar on the way in, and had a hair raising experience surfing the face of a wave in the kayak. Somehow I managed to stay upright which saved me having to swim the last 100 to 150 metres. The end result was one gurnard. It was covered in lumps to so I gave it to my mate. What causes those lumps? Does anybody know? Ed: I think it is a parasitic worm that burrows under the skin of gurnard, hope yor mate cooked it well before eating it. I decided to try a bit of drift fishing with a jig and flasher rig down the Rangitoto Channel not far from Auckland city centre. I was fishing the weekend before last and put my jig under a school of kahawai. I caught five good sized snapper within around 30 minutes. All of the fish required a net to land them, they were that good. For the next six to eight weeks there should be some magic days out in the Hauraki Gulf. The pelagic fish are targeting large schools of baitfish. Snapper will mooch along under these schools to pick up the bits missed by the kingfish and kahawai up above. So a jig and flasher rig bounced along the bottom will attract some big hits and get the adrenalin flowing. I had to break off after catching these good snapper as the flotilla of boats accompanying the Team NZ boats came bearing down at a rate of knots. It was a good day to be out. It was good to read the report for Waikawau Bay in last weeks newsletter. We were planning on going there for Easter with our bottom longline. I never knew there was all that foul ground off the beach. Knowing my luck I would have been highly annoyed if I had lost all the gear! Will have to put on our thinking caps on and work out a new spot to try for Easter. Thanks for the report Gary. The reports do not have to be recent; if you have information from past fishing trips these can be input as well. Even if you caught nothing on your last fishing trip the information is important as it helps to build a real picture of what is happening at that particular beach. Any information about your kitefishing, surfcasting, boat, kayak or kontiki experience is welcome. Thank you to all those who have contributed to the database so far. Once we have enough reports in the database we will post the average catch by month on the appropriate maps. If enough people send reports in you should almost be able to work out what you will catch before you leave home.